Congratulations! You have discovered that you are pregnant and you are excited beyond words. But, what exactly does this mean? You know that you have a baby growing inside of you, but how does it work? When does the heart begin to beat? When will the baby be developed enough to tell if it is boy or a girl? When will the baby begin to kick? When will your baby actually start to look like a baby? Are there certain things you should be doing throughout your pregnancy to help your baby grow? 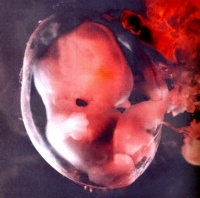 Although you can't see into the womb, fetal development doesn't have to be a mystery. Part of the enjoyment you should seek from your pregnancy is the knowledge of knowing what is happening inside so that you are aware of how your baby is developing. Welcome to our section on fetal development where you can find answers to all of your questions about your baby's growth and development. The changes that your body and your baby undergo during pregnancy can be both exciting and confusing. Put an end to this confusion by reading about fetal development and find out about the many amazing processes your unborn baby will go through on its journey toward becoming full term. Also, learn more about the three different stages of your pregnancy and developmental processes in your baby though breathtaking photos of first trimester fetal growth, second trimester fetal growth, and third trimester fetal growth. Have fun with your pregnancy by understanding how your baby is developing and enjoy the sensation of growth within. Today, doctors have the technology to predict whether your baby has a chance of inheriting any hereditary diseases and genetic disorders. Read more about genetic disorders and find out how you can predict if your baby will inherit any diseases or conditions. Find out if there is something you can do to protect your baby from this outcome. Also, learn how through the images provided by ultra sounds, doctors can detect medical conditions within your unborn baby and find out about the amazing medical advances, such as fetal surgery, to safely treat and operate on your baby while it is still in the womb.